If you have ever doubted whether agency pricing resulted in an increase in ebook prices, I have a chart that should interest you. The US Dept of Justice filed new docs this week in their case against Apple and its 5 co-conspirators. The filing is titled Plaintiff's Proposed Findings of Fact and Conclusions of Law, and this 103 page PDF lays out the arguments that the DOJ plans to make should this case go to trial. The filing includes details on how the DOJ believes the conspiracy came about, and it includes emails that the various publishers sent to each other as well as other evidence. Mixed in with the dry legal arguments were a number of charts which were created by Richard Gilbert. He's the Emeritus Professor of Economics at Berkeley University, and his charts show how the average price of ebooks increased when the 5 publishers adopted agency pricing. 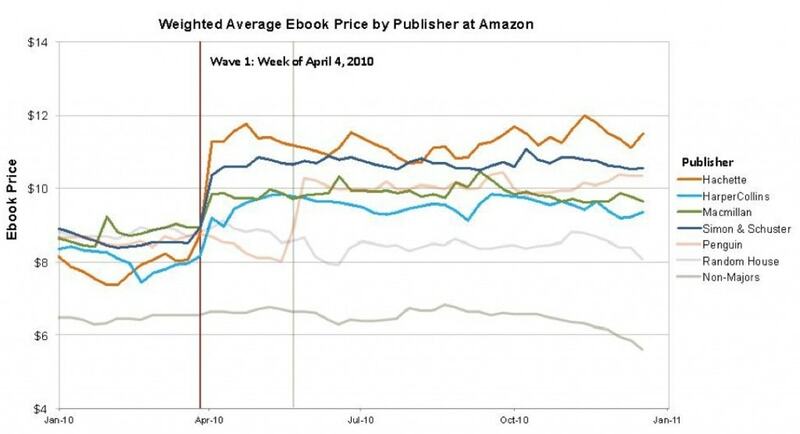 The above chart is drawn just from Amazon, but since the prices of the agency ebooks were the same across the market that is not so important. But it is still worth noting that the average ebook price for Random House and the non-majors probably does not reflect the pricing at other ebookstores; those 2 lines reflect wholesale pricing and not agency. 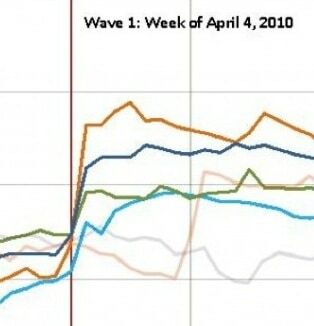 Still, the chart shows a steep increase, does it not? There is a table later in the filing that shows that ebook prices at B&N similarly increased as a result of agency. calculated the weighted average price of all Publisher Defendants’ titles in a one-week period shortly before, and another one-week period shortly after, the effective date of the Apple Agency Agreements. Measuring the difference between the two periods, he found that prices increased by 18.6% at Amazon and by 19.9% at Barnes & Noble in the weeks following the move to agency. The data in the above charts comes as no surprise to anyone who was buying ebooks at the time, but it does also stand as a reminder just how customer-unfriendly the Agency eBook Model really was. I’m not sure its customer unfriendly if it undercuts both the bookstores and the publishers. They have to make money somehow afterall. One of the theories that have been proposed is that the publishers wanted higher ebook prices because ebooks were undercutting hardback sales (or so they feared). They do make money, and they did before agency pricing as well. They are not entitled to reap extra profits by colluding with each other to fix the market. Your argument is tired and pathetic. Greed does not absolve one of wrong done. A better and more accurate chart would be the *wholesale* prices before and after the Agency agreements. The before prices included those at and below cost while the after the 30/35% retailer commission. IOW, did the publishers or the retailers benefit from it? US Antitrust is about consumer harm. What they documented was exactly that: the damage done to consumers’ pocketbooks by the conspiracy to raise prices. Where the money went is irrelevant in antitrust law; they could have used all of it to feed hungry orphans the world over and it would still be an ilegal conspiracy to extract more money out of consumer pockets. And they would still be guilty. As is, all the evidence seems to indicate the primary beneficiaries were Apple (as the conspirators intended) and Amazon (their claimed target) while losers (besides consumers) include Nook (mostly self-inflicted but triggered by the conspiracy), hardware-only ereader vendors, and indie ebookstores (like Fictionwise and Books on Board). And the conspiring BPHs themselves and their *authors* who were effectively subsidizing Apple, Nook, Amazon, Kobo, and Sony and netting lower salles and lower per-book revenue. And the BPHs now haave to deal with DOJ oversight for 5 years and pay out tens of millions in restitution. Jobs really suckered those guys. My post wasn’t referring to the antitrust case or consumer harm but specifically about the chart. We know prices had to now include the 30-35% retailer commission yet the total price increased only about 20%. I would have liked to know if the publishers were taking the hit or the retailers. Just for my own interest. The DOJ case has no further interest for me. Most of the prices on my Watchlist have not decreased after the Agency settlement. Of course, there was no guarantee that the retailers would discount even when that option was available to them. Fortunately, other non-ebook options are also available to me. It was broadly reported at the time that the publishers and their authors were taking the hit. That is why I pointed out they were subsidizing the retailers. There were dozens of reports all pointing out that when Amazon sold a $20 (list) book at cost, the publisher received $10 and the same ebook selling at $12.99 delivered $9.10 so they were giving up about a dollar per book. Which is why a lot of the publishers tried to get to $14.95 (the spikes in the chart) only to see their sales (and total revenue) go down. (Basically, they thought $12.99 would be the low-end of Agency Pricing but market forces made it the high-end.) So, not only did they get less on a per-book basis, they were getting lower sales and lower total revenues. And all they got for their troubles was to fortify the walled garden ebookstores, forclose the US market to hardware-only ereader vendors, hurt indie ebookstores, and watch Apple take market share away from everybody *except* Amazon. As for discounting now; the pre-agency discounting was intended to grow the market for dedicated readers. Well, that market has (for now?) plateaued. Plus, after the one day price war, the profits come from the ebooks, not the hardware. Discounting now is solely to promote specific ebook titles. And thanks to the DOJ settlement, there are limits to that, too.